Order your copy by any of the following methods. Signed by Author. $49.95 & $5.50 post and packaging in New Zealand. pdf. file by email for reading on tablet or computers. Order from Bushmansfriend secure on line website. Order other natural heritage and botanical books I recommend from here. Plant Heritage New Zealand covers many aspects of the New Zealand curriculum and is presented in an integrated or holistic approach. It is suited to content many students study in years 7-12. 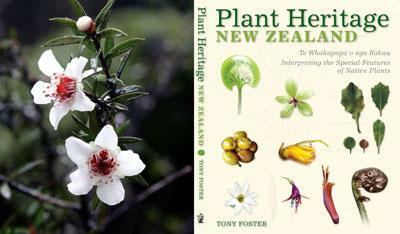 The book is attractive and well designed with over 300 photos that enthuse students about New Zealand nature. · Relate key structural features and functions to the life processes of plants, and investigate environmental factors that affect these processes. · Investigate the impact of natural events and human actions on aNew Zealand ecosystem. · Identify the key structural features and functions involved in the life processes of plants. · Explore how the groups of living things we have in the world have changed over long periods of time and appreciate that some living things in New Zealand are quite different from living things in other areas of the world. For senior secondary students Plant Heritage New Zealand is an ideal resource for bush field trips and aids in plant identification. "Discuss the factors and processes involved in the evolution of New Zealand s plants and animals". 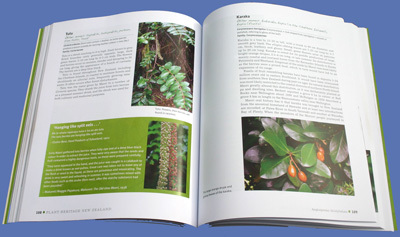 The book also presents the science concepts of botany and ecology in a student centred way, by surrounding the plants with interesting and uniquely New Zealand stories. Feedback from teachers of Maori has been positive as over 60 pepeha and whakatauki pertaining to New Zealand native plants are explained and translated to show a maori cultural uheritage of native plants. The section "Te whakapapa o nga rakau". is an account of the creation of plants by Tanemahuta mating with varoius named female personifications.